Welcome to Maschinen Schwartpaul GmbH! 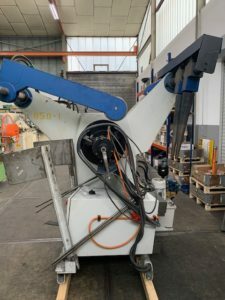 Based in two warehouses with a total area of about 1400 square meters and an exhibition room and office of approximately 400 square meters we carry an ever changing selection of hundreds of new and used machines. In our Stock List you will find an overview of our current machine inventory. If you are looking for a particular machine you can not find in our stock list, no problem – just send us a request! All used machines are refurbished and made ready for sale in our own workshop to the strictest criteria. Moreover, in cooperation with our experienced partners we provide you a global repair and spare parts service. Just write us a note and we will find a tailor made solution! We purchase used machines and production facilities! You want to sell a machine and want a quotation from us? No problem – just click the button, fill out the form below and we will get back to you soon! We buy drilling machines, automatic-, engine- and bar lathes, automatic punching presses, milling machines, screw cutting lathes, grinding machines, hack-, band- and circular saws, plate shears, etc.